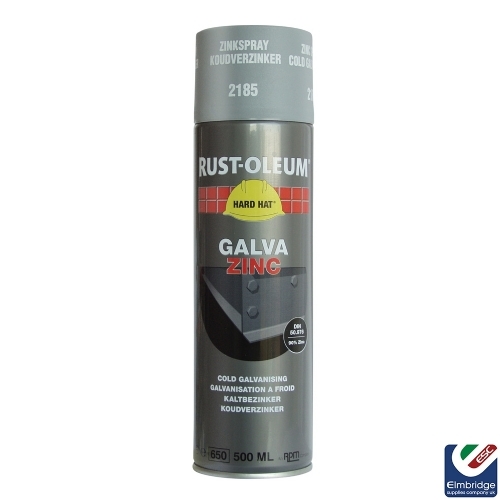 Rustoleum Galva Zinc 2185 is a fast drying, zinc rich primer that provides excellent corrosion resistance and cathodic protection of bar and galvanised steel. It is intended to be applied on small areas or for touch-up. Can be recoated with non-saponifiable coatings. Surface Preparation: Remove dirt, grease, oil, loose rust and all other surface contaminants by appropriate means. The surface must be clean and dry during application. 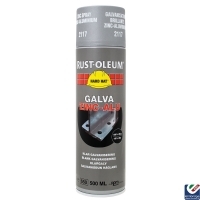 Typical Use: Rust-oleum 2185 Galva Zinc should be used on new, bare steel or galvanised steel surfaces. It is intended to be applied on small areas or for touch-up. The Spray can be recoated with non-saponifiable coatings. Rust-oleum Zinc Spray 2185 should be used as a primer or as a single coat in light industrial exposures, corrosive environments and high humidity areas. Application: For good results the relative humidity shall be below 85% and the temperature of the can and substrate above 0°C. Remove cover cap. Shake vigorously for at least one minute after the rattle of mixing ball is heard. Shake frequently during use. Hold can approx. 25 cm from surface. Use back and forth motion keeping can parallel with surface. Ensure that can is in motion when spray button is pressed to avoid runs and sags. Apply a full, wet coat to achieve a close, dense coating film, avoid dry spray. After use turn can upside down and press spray button for 2 - 3 seconds to clean valve.